But not every serious game is un-fun. Like eating your vegetables, serious games are often marketed as being “good for you” – but vegetables can be pretty tasty, and many games qualify that are marketed on other premises. Harmonix’s Rock Band franchise (forever near and dear to my heart) is, at its core, a serious games franchise about musical education. The various incarnations of Sim City teach some real lessons about city planning. Plague, Inc. sells itself as a dark-humor strategy simulation, but it pushes two clear messages: fund scientific research and wash your damn hands. Looking outside games, we find the the paragon of mixing fun and message: Pixar, Inc. Finding Nemo has a lot to say about disability. Wall-E has some pointed things to say about how we treat ourselves and our planet. Inside Out is entirely about depression and emotional health. I work with Caelyn Sandel a lot. (A lot a lot. A lot.) One of the biggest reasons is because we’re very different people, and the games we make together don’t look like the games we make alone. 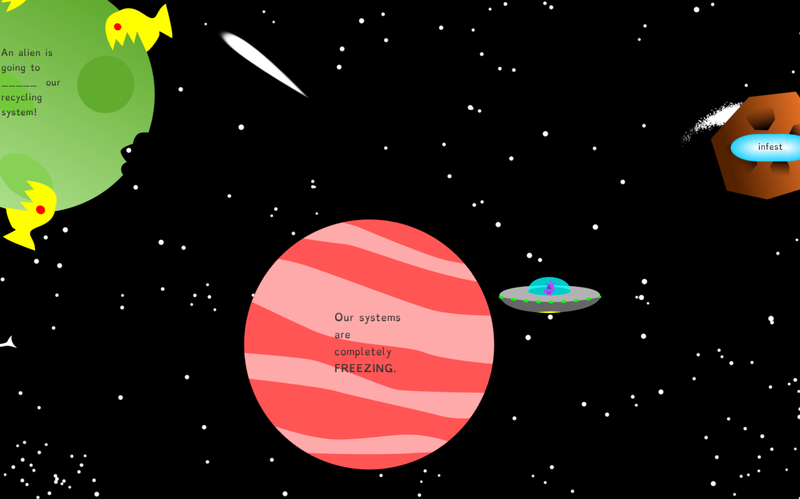 The game I initially proposed for SFGJ was a combat-free, loot-free spin off the already-exceedingly-artsy RymdResa: fly through the galaxy, find words, and make them into sentences. (I was leaning hard on the “inspire art” option.) It was going to be pretty and poetic, but it wasn’t going to be fun, and I knew that when I proposed it. Caelyn pointed out that “build sentences” sounded like an educational game, and asked if we couldn’t do a kid-friendly educational spin instead. We broke my original idea down to its mechanical skeleton: move through a space, harvest words from that space, and put those words in appropriate places sentences. After debating several reskinnings, we went back to space. 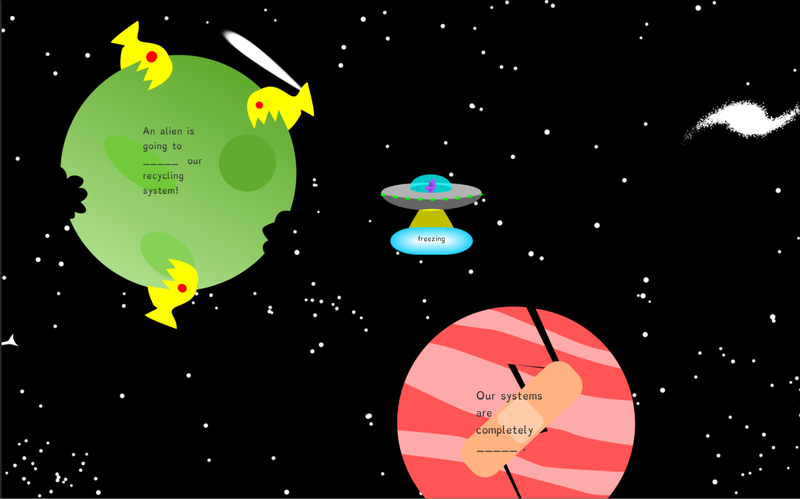 The first graphic Caelyn made was the player UFO below. I said “Oh, that’s the kind of game we’re making!” and she said “Yes!” and everything evolved from there. The result: Asteroid Words, a kid-friendly educational game about fitting appropriate words into broken sentences. We collaborated on design, and then I programmed the game, while Caelyn contributed art, writing, and sound. It’s the most polished game I’ve ever made at a game jam, and while it does teach good grammar* and insist on correct word choice, it’s also a whole lot of fun. *My biggest programming design error: words only have a single part of speech, so some sentences reject valid words. “Repair”, for example, is only a verb and not a noun. If we kept going on this project, this would be my top priority for a fix. There’s an underlying theme that I like here about how being blocked from communication is harmful in and of itself. Silence is dangerous; everyone needs and deserves to have a voice. It’s good to help others be heard. Serenity Forge (unlike most of the jams I’ve participated in) is an actual competition, and there’s a community vote! If you’d like to play some games and put a vote in, here’s the full list of games and here’s the community voting page. Many thanks to Serenity Forge and Zhenghua Yang for running this fun (and serious) event!